"I couldn't believe the generosity and the kindness." When tornadoes ripped through Washington, Illinois, in November, Cheryl Ingham lost everything, including a beloved piano that belonged to her mom. 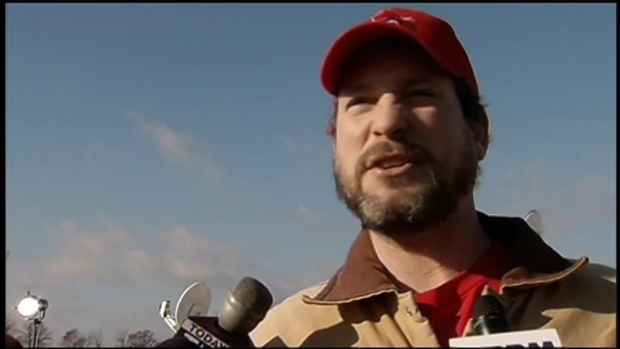 "My home was totally demolished," Ingham said. 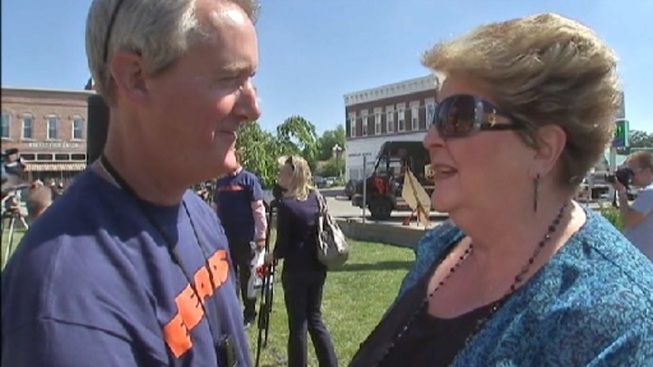 Chicago Bears owner Brian McCaskey saw her story on NBC 5 last year and wanted to help. McCaskey got in contact with Ingham and offered her one of his pianos. "Her piano was destroyed," he said. [She was] literally picking up pieces of it." Players converge on Illinois town for a day of volunteering. NBC 5's Peggy Kusinski reports. On Friday, after raising an American flag in Washington Square that flew over Soldier Field, McCaskey met Ingham in person to make good on the gift. "I was overwhelmed," Ingham said, fighting back tears. "I couldn't believe the generosity and the kindness. Unbelievable!" There's just one caveat: She has to learn the Bears fight song. But Ingham isn't worried. 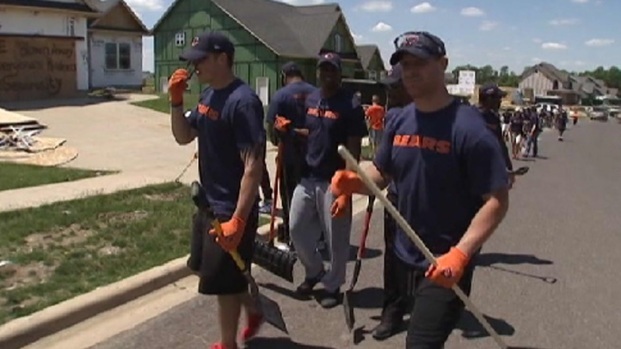 After Kyle Fuller, Ego Ferguson, Will Sutton and other Bears rookies showed up Friday to help clean up, Ingham now has thousands of neighbors who are Bears fans. 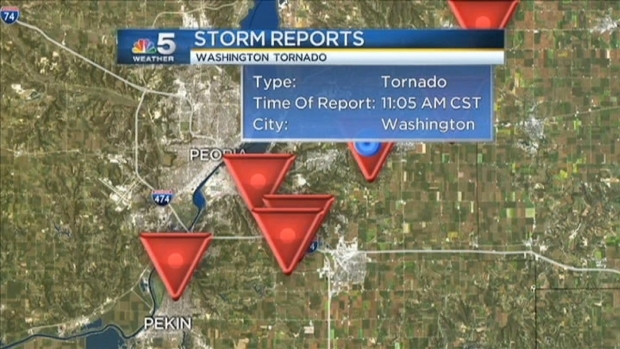 NBC 5 Storm Team meteorologist Alicia Breaks down how the storm tore through the area near Peoria, Illinois. The city of Washington was one of the hardest hit. For the rookies, the day helped them learn what it means to wear the "C" on their helmet. One month ago Fuller, Ferguson and Sutton were celebrating getting drafted by the Bears, their NFL futures filled with hope. After a three-hour bus ride to Washington, they were dealt a heavy dose of reality. Fourth-round draft pick Ka'deem Carey's eyes grew wide. Growing up in Arizona he never saw devastation like that caused by tornadoes in Washington. On this day he saw rows and rows of demolished homes. Community of about 15,000 people, near Peoria, was decimated by Sunday's storms. "Seeing how the world can be and how it affects people is an eye-opener to me," Carey said as he shoveled debris off a resident's lawn. "Definitely a shock to me." Fellow fourth-round draft pick Brock Vereen called it humbling, saying "it really hits home." Undrafted free agent running back Jordan Lynch was a Heisman Trophy finalist, but growing up in the Mt. Greenwood neighborhood in Chicago, he learned helping neighbors in need is not just the Bears way, it's the Chicago way. "Anytime something happens people come together," Lynch explained. "We're here to try to help them get back on their feet, anyway possible." "We're not just touching their lives," rookie defensive lineman Will Sutton said, "they're touching us too."